•Approved a balanced $6.52-billion budget for Metro for the 2018-19 fiscal year that begins July 1. As the staff report notes, the budget will include $500,000 to begin the draft environmental studies for the Crenshaw Northern Extension project. 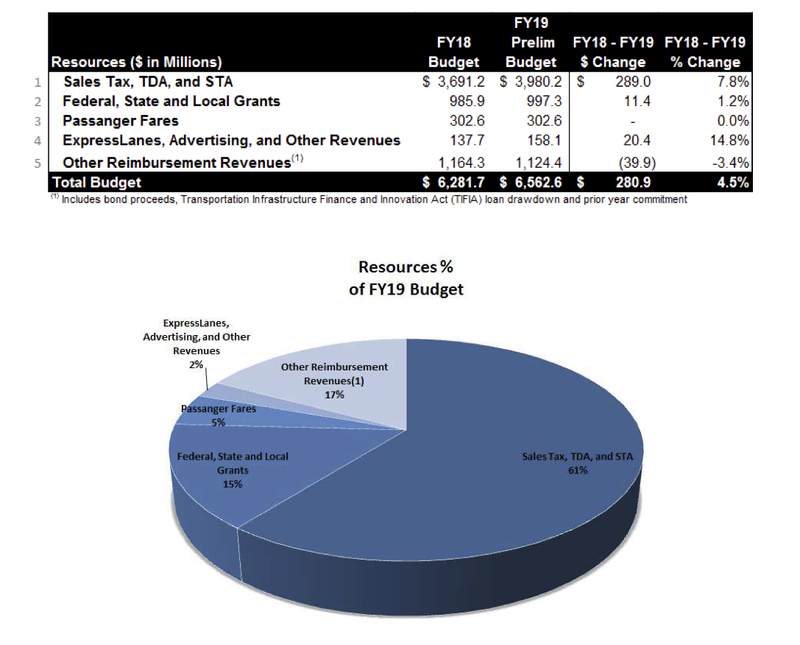 FWIW, the budget for the current fiscal year is $6.1 billion. Improved Bus & Rail Service This year’s proposed budget consists of 8,357,682 Bus and Rail Revenue Service Hours (RSH), an increase of 1.3% from FY18. Bus service hours are expected to increase by 104,081 RSH. Based on current passenger commute patterns, 15,643 RSH are for minor service adjustments to relieve overcrowding. There is an extensive rehabilitation initiative on the Blue Line, known as “New Blue” that will require line segments and stations to be closed while the rehabilitation work is performed. The remaining increase of 78,438 RSH are for Bus Bridge deployment to transport passengers during these closures. Rail service hours consist of a small net increase of 2,172 RSH. 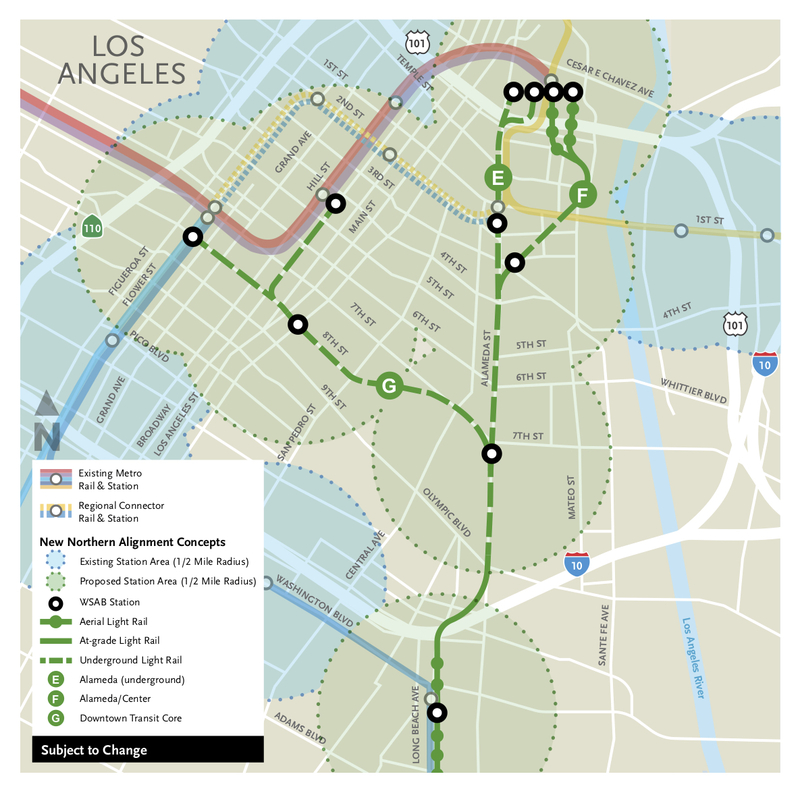 This includes an additional 32,147 RSH for service improvements, such as three car consists on the Gold Line and shorter six minute headways on the Green Line to accommodate increased demand in the morning peak hours. This increase is offset by a 29,975 RSH reduction due to “New Blue” service interruptions. As CEO Phil Washington mentioned in his comments today, the number of three-car Gold Line trains during peak periods recently increased from 10 to 12 (of 22 total). In other words, better odds if you — like me — waiting for the train at the south end of the Union Station platform. 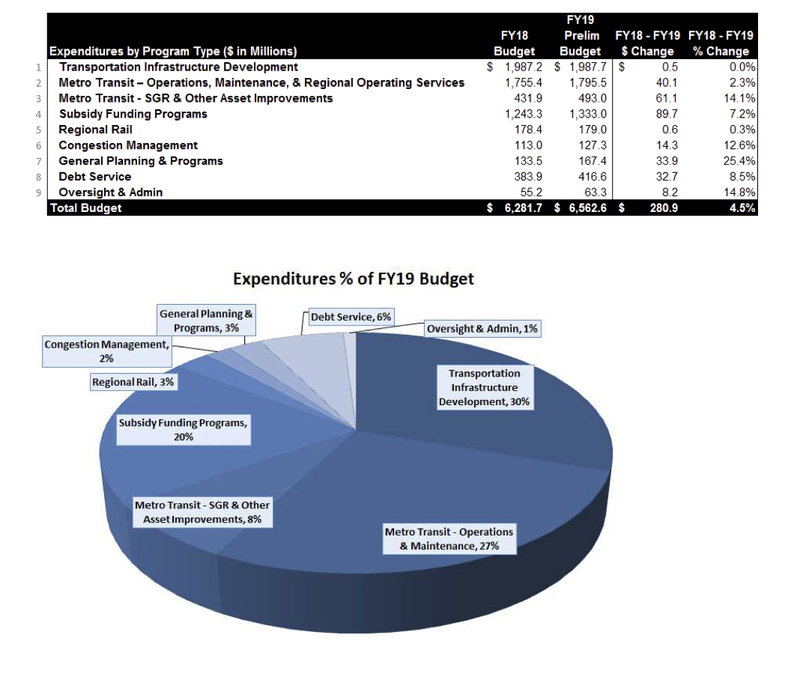 Below are the budget’s revenues and expenses. In plain English, “Transportation Infrastructure Development” means project construction. The bulk of that money in the coming fiscal year is going to work on the Crenshaw/LAX Line, Purple Line Extension and Regional Connector. For those who don’t speak jargon, STA is State Transit Assistance, TDA is Transportation Development Act (also funds from the state) and SGR is State of Good Repair (maintenance). Subsidy Funding Programs include things such as fare assistance, funds for other transit agencies in L.A. County and highway projects. •The Board approved two northern route options (E and G) for the Artesia-to-downtown Los Angeles light rail project known as the West Santa Ana Branch Transit Corridor project. Alternative F was eliminated from further consideration. See the map at right. Source post. •The Board approved a $45.9-million contract with CH2M Hill, Inc., to perform the environmental studies and design work for the Los Angeles River Bike Path Gap Closure Project to close the eight-mile gap between the Elysian Valley and Vernon. Source post and here’s a cool video. •The Board approved new, lower Metro Bike Share fares ($1.75 for a single ride, down from $3.50) and also approved a $35.48-million contract with BTS for the third phase of expansion to Culver City, Marina del Rey, Mar Vista and communities surrounding downtown L.A. Staff report on fares and staff report on expansion and a Source post. •The Board approved a $6.77-million contract with Kimley Horn and Associates to do the planning and environmental study for the North Hollywood to Pasadena bus rapid transit project. This is one of the BRT projects funded by Measure M. Staff report. There are a couple of concepts under study — street running and freeway running. Please see this presentation from 2017 that shows both on pages 11 and 12, respectively. •The Board approved expanding Metro’s Homeless Outreach Program from two to eight teams. Metro’s current outreach teams patrol the Red Line on weekdays from 7 a.m. to 4 p.m. This item would allow teams to expand to all Metro Rail lines as well as Metro’s overnight bus lines (known as Owl Service). •Finally, the Board approved a three-year funding agreement for $9.7 million with the CHP to patrol the Metro ExpressLanes on the 10 and 110 freeways. Citations have been increasing, btw, for those pondering trying to cheat the system. Staff report and presentation. Any word on the yearly bus service changes that happen in june? We’ll be listing the changes in early June. Great summary for all that is going on but please update the link to the staff report for the Pasadena-N. Hollywood bus line, it’s broken. Thank you and will fix! Thanks for the heads up! Please for the love of god restore rail service after 8pm! 20 minute headways are an embarrassment! That’s great news on the new fare structure for Metro Bike Share, and for expanding the system. Do you know when the new fare structure will take effect?